As families grow, acquire new interests or simply develop the need for separate guest accommodations, homeowners often create room additions to meet those needs. Although any added living space requires its own climate control system, it is often impractical or costly to extend your existing ductwork into the new room. This is where the convenience of mini-split systems comes in. What is a Mini Split System? Mini-split systems offer a smart, flexible alternative to extending the ductwork of a central heating or cooling system. 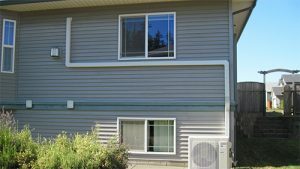 Unlike a traditional window-mounted unit, a mini-split system features compact indoor and outdoor units discreetly attached on both sides of a wall, connected through a small 3 inch hole. A mini-split system has no ducts, which makes this system is energy efficient. Duct losses account for more than 30% of energy consumption, particularly if they are run through unconditioned areas spaces such as an attic. As a full-service, Jackson, WI based HVAC specialist, Jackson Hardware Heating & Air Conditioning offers the latest technological advances in mini-split systems to homeowners throughout Washington and Ozaukee County. Whether you are building a sunroom, guest bedroom, or converting your basement or attic into a fully functional living space, a mini-split can offer the heating and/or cooling for the room without the hassle and costs of extending your ductwork. Jackson Hardware Heating & Air Conditioning offers a variety of mini-split heat pumps and air conditioners. We are committed to helping homeowners create the perfect comfort zone in any add-on room. Our Lennox-certified products operate on inverter technology that maintains a consistent flow of heated and cooled air without the typical stops and starts of traditional systems that only waste energy. Best of all, our mini-split systems are highly efficient and blend in seamlessly with any space. A mini-split system’s high precision and noiseless operation is well worth the extra time and effort. Rest assured, our dedicated service technicians will be with you every step of the way as you extend your space and maintain a consistent comfort level throughout your entire home. Why choose between the comfort of an extended living space and that of a fully functional HVAC system when you can have both? If you have questions about mini-split systems in Jackson, WI, or surrounding areas, we welcome you to contact us at Jackson Hardware Heating & Air Conditioning today. Why Jackson Hardware Heating & Air Conditioning? As an authorized Lennox dealer since 1919, we have serviced Jackson, Grafton, Cedarburg, Mequon, West Bend and all of Washington and Ozaukee counties for over 27 years. Save money today by hiring a mini-split system specialist who charges by the hour instead of a “flat rate book price”. We will NEVER take advantage of you by artificially inflating time – our motto is complete transparency and honesty with customers. No matter what time of day or night, you will always speak with a live person when you call us. For priority service or emergencies, you can reach us by calling (262) 677-3477. We are available 24/7.